The only thing about which all Pyro readers will agree is that this is a brief book, weighing in at a mere 116 pages. The size of the book, however, attests to the author's focus and conciseness. He has a lot to say, and wastes no words in saying it. Continuationism is the teaching that (at least some of) the miraculous gifts assumed and described in the Bible ought to continue in the church and, in fact, do continue to be given to the church. ... Cessationism is the opposite of Continuationism. It teaches that all the miraculous gifts have ceased to be given to the church today. Aside #1: I'd demur mildly. I would not say miraculous gifts, but rather revelatory and/or attesting gifts. All the Biblical gifts are "miraculous" insofar as they are direct acts of God the Holy Spirit on the soul of man (1 Corinthians 12:11). The subset of gifts under debate are defined by Scripture as revelatory and/or attestational in function (Exodus 4:15-16; 7:1-2; Hebrews 2:1-4, etc. ), which also explains their designed obsolescence. Waldron has an engaging way of dealing out substantial information winsomely and conversationally. After the definitions, he sounds the same note that I've sounded elsewhere; namely, that the leaky-Canon set wins the PR game by its very terminology. To my Continuationist friends who read this book, let me admit that I fear you have already defeated us Cessationists in the propaganda battle. Continuationism sounds so much more bright and hopeful than the dour and sour sound of Cessationism. In a day where it is so important to be positive (Insert here a smiley-face!) and so bad to be negative (as in "Don't be so negative! "), Continuationism sounds more positive than Cessationism (p. 14). Waldron notes that this applies even to the non-committed, who like to refer to themselves as "open, but cautious"—implying that we Cessationists are closed, and reckless (ibid.). What struck me right off about this book was that Waldron approaches the issue along exactly the same reasoning that liberated me from Charismaticism. I had sagely noted that there was no verse in the Bible that said, "Once the Apostle John buys the farm, the following gifts will be taken off the shelf: prophecy, tongues, etc." From that I concluded that the only Biblical position could be that the gifts would all continue until Jesus returned. And of course, I held the (impossible) interpretation that Jesus was "the perfect" in 1 Corinthians 13:10, so that was that. Like the doctrine of the Trinity, no single verse says this in so many words. The point in each case is to take the germane teaching honestly and seriously, and see how it adds up. As Waldron shows, no one could possibly fulfill the requirements for being an apostle of Christ today (pp. 21-44). Therefore the gift that Paul ranks as the most important and supreme gift to the church (1 Corinthians 12:28) has ceased, has fulfilled its purpose and been withdrawn. This creates an a priori readiness to accept that other gifts might also be designed for a limited shelf-life, like dissolving sutures—though no single verse may say so in so many words. So Waldron builds what he calls a "cascade" argument, where the fundamental truth of the cessation of the apostles is laid down, and other implications cascade from that fountainhead (pp. 15-16). The apostles were the chief and foundational gift, and they ceased with the first century; NT prophecy was fundamentally identical to OT prophecy, was also a foundational and Canon-creating gift, and also fulfilled its purpose in the first century; tongues are "substantially equivalent" to prophecy, and ceased with it; miracle-workers attested the giving of fresh revelation, which is no longer being given (pp. 15-16). To back up: Waldron defends the view of prophecy that all serious students would have today, were they not trying to defend a traditional understanding, and/or a pale imitation: that prophecy is defined by such passages as Exodus 4:10-17 and 7:1-2, and Deuteronomy 13:1-5 and 18:15-22 (p. 47ff.). He demonstrates that there is no solid reason for taking New Testament gift as inferior to Old Testament phenomenon. He briefly but tellingly demolishes recent attempts to make up a sort of semi-prophetic gift so as to provide cover for the complete failure of modern "prophecy" to measure up to the Biblical reality. Aside #2: isn't it rather remarkable to argue that the New Covenant is a better covenant—and yet that its gifts are inferior? Under the inferior, older covenant, prophecy was inerrant, or it was not prophecy. But under the better, New Covenant—without a whisper of warning or note—it's demoted to hit and miss holy guesswork. Silly, silly, silly... unless, I suppose, it's your ox whose goring you're desperate to prevent. Then, the wish is father to the theory. Waldron also discusses the Biblical gift of tongues, and agrees with Luke and Paul that it is the supernatural gift of unlearned human languages. He deals with the attempts to controvert the Biblical data, then argues that translated tongues are the functional equivalent of prophecy (pp. 88ff.). He points out that Acts 2:14-18 quotes Joel's prophecy about, well, prophecy, as applying to the outburst of tongues—which makes no sense if tongues are unrelated to prophecy (p. 89). Waldron also notes Paul's statement that "The one who prophesies is greater than the one who speaks in tongues, unless someone interprets" (1 Corinthians 14:5; p. 89). Paul's implication is that translated tongues are equivalent to prophecy. Waldron also points to the parallel between prophetic knowledge of mysteries in 1 Corinthians 13:2, and speaking mysteries by tongues in 14:2 (pp. 89-90). Tongues are related to prophecy, and prophecy has ceased; therefore tongues have ceased (p. 90). This makes fact of the silence of Bible-level prophecy and tongues from the first century until our own; as a bonus, it doesn't require us to torture and mangle perfectly innocent texts to "define down" modern imitations. The book closes with some very powerful remarks and applications from Luke 16:19-26, contrasting Scriptural sufficiency with its competitors: Roman Catholicism and Charismaticism (pp. 109-115). Evaluation. Waldron has made a worthy, emphatically-Biblical contribution to the discussion. I could wish it were twice the size; I could also wish that the endnotes (A) had been footnotes, and (B) had been much more carefully proof-read, to weed out the numerous, largely-typographical errors. I'm also not convinced by his position on 1 Corinthians 13:8-10, but that is hardly a pivotal single consideration. On balance, I can gladly recommend To Be Continued? as a helpful and useful voice for Biblical sufficiency in the face of the traditionalistic, leaky-Canon shoddiness that defines modern Charismaticism. Pyro rating: 4.5 matches out of 5. Finally, a book review! More of these would definitely be welcome from TeamPyro. My to-read list is badly overgrown right now, but I'll add this book to it. Let me be the first to argue with myself. "What?! 'Defines'?!! How can you say that? What about This Big Name, and That Big Name, and The Other Big Name? Are you better than they?" Er, sorry. My point is similar to Phil's about the best of the emergers (a very relative praise): what distinguishes Charismaticism from Biblical Christianity is shoddy and has become traditionalistic. Phil's made this point in his way, and I've made it in mine. Bundle up all the distinctive contributions of modern Charismaticism since it was invented a hundred years ago. Tell me what they are. And by "distinctive," I mean bind all the pop-off-ecies, all the "tongues," all the words of "wisdom" and "knowledge," into one volume. Weigh that. Nothing else counts. Do some of them preach Christ? Praise God. So do all Biblical Christians. Do some of them occasionally open up a Bible verse or two effectively? Praise God. So do all Biblical Christians. Do some of them evangelize? Praise God. So do all Biblical Christians. Steve: My to-read list is badly overgrown right now, but I'll add this book to it. 116 pages? I think even I can manage that. I will definitely be checking this one out. 1. Full credit for the clever idea behind yesterday's "Emergent Detergent" picture goes to Mr. Phillips. 2. Pecadillo saw me working on several images a few months ago and warned me that if the picture of the Flying Nun ever showed up on the blog, he would resign as a contributor. Let's not let him see this post. Thanks for this overview, Dan. Well reasoned. BTW, what is his position on 1 Cor. 13:8-10? And yours? Is there another post on this topic? I used to think it couldn't be the canon, but now I do. Another good book to add to the reading list. DJP wrote "Bundle up all the distinctive contributions of modern Charismaticism since it was invented a hundred years ago. Tell me what they are." As far as I can tell there aren't any. (Unless you count spritual pride as a contribution). Phil - Maybe Pecadillo will arrest the Flying Nun for flying without a license. I've already started next year's list of "50 books to leave on the shelf". This will be a great addition! here is the url to an excellent article from a completely different perspective than Waldron. Poythress points out (among many other things) that while apostles have "ceased" preaching the word has not. He says "Modern visions, auditions, and “prophecies” are not inspired, because the canon of the Bible is complete. However, these modern visions and auditions may be analogous to the Book of Revelation, just as modern preaching is analogous to apostolic preaching." and "Cessationists argue that New Testament prophecy was inspired and has therefore ceased with the completion of the canon. But there are still noninspired intuitive gifts analogous to prophecy." This seems to me to be a response to the "the apostles ceased so the other gifts must have to" line of thinking. Certainly we don't have no one is Paul, but that doesn't mean no one today is "gifted" to preach. No one is John. That doesn't mean no one one is "gifted" with prophesy. Both must be scrutinized under the light of scripture, and neither are authoritative apart from it. That is one of the arguments Poythress uses. Where does it break down Dan? "certainly we don't have no one is Paul"
Joey: "Where does it break down Dan?" It's simply a milder form of cessationism, and it has no more biblical proof-texts than the more sane and consistent (and historic) kind of cesationism Waldron argues for. I'm off with Darlene to Rio Rico Arizona, for a conference this weekend on the life and ministry of Spurgeon. Then I fly to Tulsa, and drive to Little Rock for a Reformation Day celebration at the Bible Church of Little Rock. Then we're going to Bradenton for some board meetings with Aurora Ministries. I'll be back home in a week. That means (prolly) no blogspotting this weekend. Dan or Frank will also have to do the Weekly Dose of Spurgeon Post. Why do I never arrange these things before I'm sitting in the departure lounge? Here's something to look forward to: I've got a guest-blogger lined up to make a post in the middle of the week. It certainly seems that way in the charismatic churches - whenever I heard speaking in tongues, the interpretation invariably started out "My people...", as if they were words from God. But there are really only two places in Scripture where the content of tongues is defined: Acts 2:11, where the content is praise ("...we hear them declaring the wonders of God in our own tongues!" - NIV), and 1 Corinthians 14:2 ("For anyone speaks in a tongue does not speak to men, but to God." - NIV). Later on in the same chapter (vv. 13-17), the content is again described as prayer, praise and giving thanks. It was this understanding - that tongues was upward to God rather than downward from Him - that confirmed my skepticism of the entire modern tongues phenomenon. Phil, Bradenton, eh, can't stay away from sunny Florida, can ya? Dan, so that we may see further clarification as to some pet doctrine stuff that perhaps no one will bring up, I will now assume the role of advocatus diaboli in two posts..
(Acts 5:12 NASB) And at the hands of the apostles many signs and wonders were taking place among the people; and they were all with one accord in Solomon's portico. (2 Corinthians 12:12) The signs of a true apostle were performed among you with all perseverance, by signs and wonders and miracles. (Hebrews 2:3-4) After it was at the first spoken through the Lord, it was confirmed to us by those who heard, 4 God also bearing witness with them, both by signs and wonders and by various miracles and by gifts of the Holy Spirit according to His own will. Scripture certainly indicates that the apostles served a unique foundational role in redemptive history and that they were uniquely empowered for ministry. The problem with this argument, however, is that its conclusion does not follow from the premises presented. The argument can be broken down into a syllogism. Major premise: The apostles, as the foundation of the church, experienced unique wonder-working powers to authenticate their ministry. Minor premise: The apostles are dead. Conclusion: No one experiences wonder-working power in ministry today. Major premise: The book of Acts tells us that the apostles planted churches. Conclusion: No one should plant churches today. The strongest evidence refuting this premise is Scripture itself, giving evidence that Christians, other than the apostles, used the miraculous gifts. Mark 9:38-39: An unknown man casts out demons in Jesus’ name. Luke 10:9: Jesus commissions seventy-two disciples to preach and to heal. Acts 9:17-18: Anannias heals Paul. Romans 12:6: Paul refers to the gift of prophecy in Rome, a church not yet visited by an apostle. 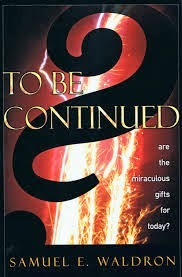 1 Corinthians 12:8-10: Gifts of healing and miracles are experienced in the Corinthian church without an apostle present. Galatians 3:5: Paul refers to the Holy Spirit who “works miracles among you.” The word “you” is plural and must refer to the entire congregation, which was not led by an apostle. 1 Thessalonians 5:20: Paul demands that the Thessalonians not hinder the prophetic gift. While the apostles were uniquely gifted, it cannot be inferred from Scripture that the miraculous gifts were limited to them or that they died with them. Whoever set up this conference needs to advertise it better. Had I known about it, I'd have signed up in a heartbeat. I was brought up in a cessationist tradition. My current church, however, is trending slightly toward allowing prophecy and tongues (although highly regulated in their exercise during worship services). I've been slow to accept this, and even though I'm a deacon at this church, the pastors are fine with that. That said, about half a dozen times in the last couple of years I have witnessed fellow saints exercise what appears to be a miraculous manifestation of the gift of tongues. I retain my skepticism, and yet I have no good explanation for what I have witnessed. So. What am I seeing here? ok, so it is a form of cessationism because it agrees that the canon is closed, and authoritative. But the disagreement you would have is that you would go further and say that "lesser gifts" aren't any more supported by proof-texts than the all-out cessationist point of view. and further, the all-out cessationist perspective is more biblically consistent/historical/sane etc. Hopefully that represents your view in an accurate, if limited way. So, obviously, you would argue that when Paul was instructing the Corinthians on the proper use of the gifts that he was speaking of prophecy as defined in the OT, toungues and interpretation and miracles/healing as extraordinary attesting gifts that would soon pass. This seems to me to miss the whole point of what he was aying to the Corinthians. If prophecy was no different in Corinth than in the OT, why the instruction for two or three to speak, and others to judge what was said? If prophecy was infallible, why judge? Did they judge to decide what was infallible and what wasn't? this would imply that Paul wanted the Corinthians to limit infallible messages from God to two or three times per meeting. at that rate, if they wrote them down, they could have had several books of infallible words from God during the course of a year. Also, why did Paul emphasize the use of Prophecy (as well as tongues and interpretations) as being for the upbuilding, encouragement, consolation etc of the church if they were primarily "attesting" gifts for a limited time? He compared the gifts to parts of the body, his favorite illustration for the church, and told the corinthians that all the gifts were useful and to earnestly desire them. Why? Because they were upbuilding etc, not because they were revelatory or attesting (primarily). I don't want to go on and on so I'll stop there. I'm away for the next few days, and was wondering what to take to read. As this is on my shelf, I think I'll take a look. Regarding the argument that modern visions and prophecies are not inspired in the same way preaching is not inspired, but related to prophecy. I found that an interesting comment that made me think - but it seems to me that preaching was an Old Testament gift as well as in the New Testament. It has not changed. Therefore we should not expect NT prophecy to differ from OT, and the same goes for other gifts such as vision, etc. Prophecy brought new revelation to the people. Preaching applied and explained the revelation that had already been given. and that is what we do today when we preach the Bible. Do you think that apostolic preaching, and the preaching done today are of the same type? The point that Poythress was making (I think), was that, just as we do not stop preaching because we are not Paul, we do not stop prophecying because we are not John. Those men had unique gifts. "Are all apostles? Are all prophets? Are all teachers? Do all work miracles? 30Do all possess gifts of healing? Do all speak with tongues? Do all interpret?" These were obviously rhetorical questions, yet Paul encouraged them all to earnestly desire the spiritual gifts, especially prophecy. I doubt he was telling the corinthians to earnestly desire OT prophecy for reasons I have already stated. If Paul was encouraging the corinthians to bring new revelation from God, the context in which he said it would make no sense. I think you are right about what preaching is, I would just say that the apostles did it with an authority that ceased when they did. John prophecied with an authority than died with him...but just as we don't stop preaching because we don't have Paul's authority, we shouldn't stop prophecying because we don't have John's. Joey quotes -- Modern visions, auditions, and “prophecies” are not inspired, because the canon of the Bible is complete. However, these modern visions and auditions may be analogous to the Book of Revelation, just as modern preaching is analogous to apostolic preaching." and "Cessationists argue that New Testament prophecy was inspired and has therefore ceased with the completion of the canon. But there are still noninspired intuitive gifts analogous to prophecy. ... then asks Where does it break down Dan? You see, if you're going to say, "OK, here's what the Bible calls 'X,' clearly defined. Here's something that's almost nothing like it -- but let's call it 'X,' anyway! Otherwise, I'll be less popular, will be seen as narrow, and it will make people feel bad!" -- if you're going to say that, why not go for it, big-time? Why can't I just take my big kitty Hagrid and say, "Yessir, he's an apostle, Hagrid is! Anyway, he's analogous to the apostles, because they both had like whiskers, four limbs, and two eyes... so he's an apostle too!" Yes, I agree the Apostles preached with an authority we don't have - by virtue of their office (I also agree that both their authoritive preaching and office have ceased). But even in OT times, there weas preaching carried out by ordinary people - not prophets. It was part of the work of the priests and Levites. It isn't as if preaching came along after prophecy ceased. Preaching, as we know it today, was an OT practice and has merely continued, as it did during OT times and the intertestamental times when there was no word of prophecy. Marc -- clearly the gift of "punk" is still extant. Et tu, Even? Where did I argue that they were given solely to authenticate the apostles? No, they won't. If I bet you big money, I'd win big money. They WILL NOT allow prophecy and tongues. If they do, they'll be the first in 1900 years. Oh, they may allow babble and mystical guesswork in holy costumery. But allowing supernaturally-given, unlearned human languages? And inerrant direct revelation? Won't happen. As to what you're seeing -- you don't want me to tell you my opinion. I don't want to slam anyone's church. Take the Biblical facts, make the application you find to be wisest. Joey again: If prophecy was no different in Corinth than in the OT, why the instruction for two or three to speak, and others to judge what was said? If prophecy was infallible, why judge? Um, because it was the same as OT prophecy, which was also to be judged (Deuteronomy 13:1-11; 18:21-22)? You did read the post, right? Do you think there are NT apostles of Christ about? Explain to yourself why that is, and you can answer your own question. Dan, any chance of an answer on 1 Cor. 13:8ff? If not, that's okay. I'm just interested in what his views are, and yours if you're of a mind. I'm trying to work out the issue for myslef. Thanks. Poythress is "making it up" in the sense that there is no verse in scripture that says "as with preaching, prophecy will continue after the apostolic age, but without the authority of infallible divine revelation." However, Poythress is simply applying common sense and good hermenuetics (you should read his article) to verses that are actually in scripture. The verses indicating that the church should operate in the spiritual gifts outnumber those that say that they shouldn't or those that say that the gifts will cease at the end of the apostolic age or there abouts by...well...let's say a lot to a little...and that's if you include an interpretation that (how do you put it?) mangles 1 Cor 13:8-10. So who's "making it up"? jsb -- Waldron says that "The contrast is between the partial knowledge of the present state and the perfect knowledge of the eternal state" (p. 64). He thinks the passage doesn't say one way or the other when these gifts will cease. I set forth my view here. From your quotation, Joey, Poythress is. As I explained. I really am growing in my feeling that you're not reading the post and responses. Thanks for the review. This book is calling my name. Needed study for me, and my church. BTW, your witicisms lately have been very much a blessing to me. The Lord has blessed you with an above average sense of humor. Don -- BTW, your witicisms lately have been very much a blessing to me. I strive for wit, but fear I am often only get half-way there. You did it again. Cracked me up. Many thanks, Dan. I agree with you. And, like you, I did not start with this view. I even resisted it. But not now. Yes, it is sort of "out of style" these days, but that's irrelevant, isn't it? Right, jsb. Oh, and I meant to say, there are many views on the passage, each of them (including mine) with its own difficulties. "You did read the post, right? Do you think there are NT apostles of Christ about? Explain to yourself why that is, and you can answer your own question." sorry i wasn't more explicit in how I was disagreeing with what you said. I will try again, more briefly. The correct answer to the question in the above quote is "no" there are no NT apostles running around anymore. "Explain to yourself why that is"
This is because those men were uniquely gifted by God for a specific purpose in a specific time. When the scripture had been completed, and the gospel of Christ had been spread and the seeds of the church had been planted, watered, and the Lord had started to grow it, there was no more need for NT apostles. Correct so far? so I am supposed to say, "so it is with all the NT gifts". The canon is complete, the church has been established etc...no need for prophecy and tongues and miracles. However, I don't see scripture teach that, and so I don't believe it. Yes the canon is complete, we still need preaching...yes the scripture is authoritative, we still need the body christ to build each other up...yes the church has been established, we still need accountability, pastors, teachers, correction etc...why? Because the scripture tells us we need those things...if someone has the gift of healing, should they not pray in faith for someone to healed because the scripture is enough? No, they should do as the scripture instructs and pray for healing. That doesn't call the authority or sufficiency of scipture into question, it affirms it. Some of the modern prophets (Mike Bickle who's not a prophet but greatly influential in the movement, Bob Jones, Paul Cain and Rick Joyner) sidestep the whole apostolic issue by arguing (not even an operative term here because it's so outlandish) that God is going to be RESTORING APOSTLES to the church in the end times! Of course the source for this is a "vision." But people buy into it on a grand scale. Bob Jones (the "prophet" not the university) has even had the audacity to say that prophecy today is "getting more accurate" and that God's cool with about 66% accuracy. He then goes on to say that God is responsible for the false prophecies to "scare the devil, like shooting blanks!!!" Joey, you say this about the apostles: When the scripture had been completed, and the gospel of Christ had been spread and the seeds of the church had been planted, watered, and the Lord had started to grow it, there was no more need for NT apostles. This is where I still feel you don't "get" the post, nor the discussion. If you have the time and inclination, re-read the post. Then re-read these two statements. Either prove, from explicit Scripture, the first, or re-consider the second. I do feel as if you, nice guy that you clearly are, keep asking questions I've already answered again and again. Dan, I would really like to know specifically what you find wrong with Waldron's interpretation of 1 Cor. 13:8-10. And honestly, I would want your interpretation to be correct because it would be a very solid proof-text against continuationism. But unfortunately, I find Waldron's interpretation to be the most consistent. Maybe you could do a post and interact with all the various interpretations of this passage? But until then....YOU ARE WRONG!! MUUAAAHHAAHHAAAA!!!!! Jonah -- do you know/remember Jon Lovtiz' "Liar" character from SNL? I can hear him saying, "They're not accurate because they're... they're... they're like shooting blanks ... to... to... to scare the Devil! Yeah, God's shooting blanks, to scare the Devil. Yeah, that's the ticket!" Mike, your picture scares me too much. Pass. Exactly, simply back-peddling. But if you are promising power that will be like "the book of Acts plus the book of Exodus times ten" then you have to come up with some disgusting justification that even Grudem would write off as incorrect. Even Grudem! if you see the gifts as only being revelatory and attesting, then the argument in the book follows. if you see them as for the upbuilding, encouragement, and consolation of the church (and all the practical implications of that) then the argument does not follow. So his argument works against Benny Hinn, but not Piper. All of my comments about Corinthians were my attempt to give a biblical reason for being in the Piper camp. Obviously you feel I failed...alot. There are a few things that I would question about this post. First, in reference to Aside #2, why is it that the gifts are seen as inferior to what they were under the Old Covenant? Is that said anywhere in the New Testament? Not to my knowledge. There is a fundamental difference between OT prophecy and NT prophecy, but that would make sense, wouldn't it? Moses would enter the tent and actually speak with the Lord. But since Christ has come, died and now ascended, He sent the Holy Spirit in His place. Becuase we are fallible, finite, sinful creatures, we are "hit and miss" as you call it. But because it is a better covenant we are not put to death for it! So what is more fallibe, actually speaking audibly with God, or receiving subjective impressions (based on objective truth) from the promise of God, the Holy Spirit? The answer is obvious. Secondly, I think Waldron has misinterpreted the Acts passage where Peter quotes Joel. Peter is not linking tongues and prophecy as the same thing (see 1st Corinthians 14:2 "For anyone who speaks in a tongue speaks to God not to man", whereas prophecy is God speaking through man.) He is explaining, by way of Joel, that the promise of Christ has come, by God pouring out his Spirit, and therefore the Joel prophecy coming to pass. Rationale: Discontinuity proves the cascading argumentation is viable. Unless it wishes to contradict the plainest evidence – what evidence, not biblical, but experiential, empiric, what you as a cessationist has seen or heard of, or the lack thereof? Why is this any different than the continuationist and his supposed leaning on experience? These are common arguments for cessation. But a plurality of discontinuity between the first and twenty-first centuries does not discount the gifts. What about the discontinuity between the dark ages and the enlightenment, or the Reformation? Didn’t we “discover” or rediscover new doctrine then? What about the move of God? Not working exactly as before? Of course not: Does God work in exactly the same manner in individual lives? Not exactly the same does not have to mean less than before. To limit the Spirit to “continuity” is to control rather than yield to the possibility (not necessarily probability) that God will do like things today. This depersonalizes God, and errs on the side of deism. The Spirit of God does work in different ways today than before, and always has. In the Old Testament the Spirit came upon people, in the New and to today, he comes into people, and also (Apostles at least, and believers today who have faith in gifts) has come into and on people. Some see miracles and some do not. Why not more power given today not less? The last leg of a relay race involves the anchor, and is always the fastest leg of the race. Why not, as we approach the last days, and evil increases, see a greater measure of the Holy Spirit’s power to change lives and overcome evil to the glory of God? JD again - Dan, did you see Grudem address this book and this man @ Challies, and what did you think? I am presently finishing up this book and have found it to be very refreshing. Mr. Waldron does a good job at staying on topic and also does not appear to be just throwing in his slant. The book is filled with Scripture and his purpose in communicating this gross error has been handily achieved. I wasn't going to comment on this post, but after reading this I was given the courage to post...my comments to follow shortly. Good book review. Did Waldron interact directly with Grudem's view of NT prophecy? Mike-e's picture scares me too, but I'll bite anyway. I won't go over all the common arguments, which are well known. I wasn't TOTALLY convinced by them. What finally convinced me was when I found three words in 1 Cor. 13, "face," "glass" and "perfect" used by James in a similar context (1:23-25). James is clearly referring to the Word here. The elements in 1 Cor. 13 line up perfectly (to coin a phrase) with James. Scripture interpreting Scripture. What a concept. I don't care to enter this debate, but I do have an honest question. To wit: if it could be established that BIBLICAL acts of healing took place within the past one hundred years in a particular revival -- I'm not talking about the Benny Hinn type frauds, or the pseudo-tongues movement of today (as opposed to genuine tongues), and the fraudulent prophecy movements of today (as opposed to genuine prophetic utterances by the Holy Spirit, in which the prophecy infallibly comes to pass), or the difference between prophecy of the OT and the NT, and so on, for Satan is a counterfeiter of all genuine movements of God, at least where he is capable of effecting a counterfeit -- but rather, I'm talking about a BIBILICAL miracle, such as miracles of healing consonant with those in the book of Acts -- if it could be established with sound, historical EVIDENCE that such miracles of healing took place within the past one hundred years in a revival or two, what effect would this have on the cessationists claims? In other words, would this -- if it could be soundly, historically established with EVIDENCE -- not naked assertion, or sleight-of-hand gimmicks, or such things as argument from authority, and such like -- but if it could be SOUNDLY, HISTORICALLY established with EVIDENCE according to the standard rules of evidence, would this violate the standard cessationists claims? Hmmm... not quite. You're closed and they're (continuationists) reckless. His words, not mine. Open would be in contrast to cessationists and cautious in reference to the continuation of the gifts. We know for sure, therefore, that one gift, and that the greatest gift, has ceased to be given. There are no more Apostles (capital A): agreed. But the NT makes reference to apostles other than Paul and the twelve, for instance in 2 Corinthians 8:23 (where some versions translate the word as "messengers). Is it not possible that the office of Apostle has ceased while the gift of messaging continues? There is nothing in 1 Corinthians 12 that I see that says the Greek has to refer to Apostles. And if the first domino doesn't fall, what happens to the cascade? Which part of the Canon did Philip's unmarried daughters and Agabus create (Acts 21:8-10)? Should we expect more Canon during the tribulation (Revelation 11:3)? They may maintain their claims to continuing prophecy in the church, or they may have a closed canon. Or they maintain that the Bible shows in Acts 21:8-10 that not all prophecy is Canon. 1. You've read the book, and feel I misrepresented Waldron? Please quote. 2. Your oft-answered "what about unrecorded prophecies" replay suggests you haven't quite followed the argument, haven't considered the implications of the view of 1 Corinthians 13:8-10 that you reject, and don't see the close of the Canon an event of much significance. Which is a common mistake made by leaky-canon sorts. Your only yet-unanswered question is the Revelation question, and I don't have an answer of which I'm confident. Obviously, the closedest closed-Canon Christian believes the day will come when God will once again speak directly to His people -- after the advent of Christ. Is it your position that we're in the Tribulation, and the Return will be within seven years? ". . . if it could be soundly, historically established with EVIDENCE -- not naked assertion, or sleight-of-hand gimmicks, or such things as argument from authority, and such like -- but if it could be SOUNDLY, HISTORICALLY established with EVIDENCE according to the standard rules of evidence, would this violate the standard cessationists claims?" If I witnessed someone who had no arm suddenly and fully receive a real, complete and functional arm as a result of a godly man calling upon the name of the Lord to heal this person, I would seriously rethink my position. However, I don't believe this will ever happen, as we have the Scriptures with which to compare the preacher's message, and no longer need the "miracle gifts" to validate his authority. "If I witnessed someone who had no arm suddenly and fully receive a real, complete and functional arm as a result of a godly man calling upon the name of the Lord to heal this person, I would seriously rethink my position." Thank you for answering, but that is not my question. Even though you might witness something like this, this -- in and of itself -- would not be considered sound, historical evidence according to the rules of evidence. It would take much more than your single testimony. So back to my original question -- if it could be established by sound, historical evidence according to the rules of evidence that a miracle(s) of healing took place consonant with the book of Acts within the past one hundred years, would this violate the standard cessationists claims? I'm a cessationist. It would be "sound, historical evidence" to me. I thought that's what you were asking. "I'm a cessationist. It would be "sound, historical evidence" to me. I thought that's what you were asking." There is a VAST difference between that and anything you might single-handedly witness or observe. I have enjoyed reading this blog for a while but don't think I have posted here before. Your response to Taliesin (re: Acts 21:9, and possibly 1 Timothy 1:18), seems to just basically ask people to assume a cessationalist interpretation of 1 Corinthians 13 - I have not been convinced of your interpretation. Would it be possible for you to explain further your thoughts on Philip's daughters please. Sure. They spoke before the completion of the Canon. Complete did away with need for partial. "fundamentally identical to OT prophecy, was also a foundational and Canon-creating gift..."
Isn't what Philip's daughters doing separate to canon formation? Lamblion, for me it's too late. By that I mean they'd have to demonstrate that, like the gifts of pastor, teacher, helps, administration, mercy, etc., the revelatory and attesting gifts have been all over the Christian church for 1900 years. Which it's too late to do. The burden of proof is all on the leaky-Canoneers. I'm not obliged to prove a negative. And to the oft-heard attempted rejoinder, "What about the Reformation? ", I'd simply observe that the analogy doesn't even begin to work. First, you'd have to demonstrate that God wasn't justifying anyone by grace alone, through faith alone, for 1400 years. All genuine prophecy has always been, by definition, inerrant, or it wasn't prophecy. This is the caliber of revelation that formed the Canon. It isn't Breaking News that God did not choose to incorporate it all into the Canon. But then, before the completion of the Canon, there was need for multiple revelatory resources. There is no such need now. And the connection between any of that, and the mockery that has gone under the name of "prophecy" for the last century is...? Since the tribulation is in the past (sometime around the Siege of Jerusalem), it would be a moot point today. The problem I haven't overcome with cessationism is that I think God still heals (and am not sure why healing would be a revelatory gift), and there evidences that he give tongues (only for foreign languages) sometimes. "So back to my original question -- if it could be established by sound, historical evidence according to the rules of evidence that a miracle(s) of healing took place consonant with the book of Acts within the past one hundred years, would this violate the standard cessationists claims?" The answer is no. The Apostles performed "many" miracles, not just healings, and not just healings in one fashion (e.g. people touching Paul's apron or handkerchief). There was raising the dead, too. These were all in public and among skeptical and even hostile observers, done by more than one man but around the same time. So, no. "A miracle(s)" would not suffice. 1 Thessalonians 5:20-21 tells us to test prophecy. The undisputed fact that there has been lots of false prophecy in the last 100 years cannot be an argument for none of it being genuine. Why was there a need for multiple revelatory sources in the time of Philip's daughters. I would guess that a fair amount of the New Testament had been written by that time. I don't think Philip's daughters would have revealed new things that were unknown, but which later got revealed to the writers of the New Testament. Thanks to DJP and JSP for answering, but I still am looking for a more specific answer, which JSP sort of came up with, but not quite there. If a series of miracles of healing consonant with the book of Acts could be established soundly and historically ACCORDING TO THE RULES OF EVIDENCE, would this violate the standard cessationists claims? In other words, would this falsify the claims of the cessationists? That is ALL I am asking. I don't really care about you personal opinions. No offence intended. I simply would like to know that if a series of miracles of healing consonant with the book of Acts could be validated ACCORDING TO THE RULES OF EVIDENCE, would this FALSIFY the claims of the cessationist? Sorry, evidently I wasn't clear. Perhaps because I was trying to be funny (which is always a stretch for me). I'm not disagreeing with you (I'm assuming your interpretation of Waldron is correct). What I'm saying is that Waldron assumes "open but cautious" applies only to the cessationist position, hence we are saying you are "closed and reckless". My point is simply that for myself (and I think most people who hold that position) "open" is to distinguish from the cessationist "closed" (so he's right there) but "cautious" is to distinguish from the continualists "acceptance" (I'm put in your bind that my "descriptions" immediately make me look negative). Clear(er)? No, I think I've followed the argument, and we're just of different opinions. It seems to me that if there is non-canonical prophecy before the canon is closed (the Acts passage) and non-canonical revelation after the canon is closed (the Revelation passage) I cannot draw a hard line that says there cannot be non-canonical revelation now. As for your last question, I am historic pre-mil (post-trib). But to your real question, no, I don't think we are in the tribulation, but the statement above is why I don't think this would be necessary for prophecy to continue. Also, your response to Ben (Complete did away with need for partial) seems to assume a particular position on 1 Corinthians 13:8-10 that personally I find unconvincing. LambLion: No, it would not. A miracle (10,000 miracles)would not disprove the cessationist position. Most cessationist are not arguing that miracles have ceased, but that certain spiritual gifts have ceased. Miracles can happen apart from the gifts. "LambLion: No, it would not. A miracle (10,000 miracles)would not disprove the cessationist position. Most cessationist are not arguing that miracles have ceased, but that certain spiritual gifts have ceased. Miracles can happen apart from the gifts." I'll assume that DJP and JSB will agree with this. If not, they can correct me. Accordingly, what would it take to FALSIFY the claims of the cessationist? Again, please refrain from personal opinions. I am simply trying to establish a forensic demarcation here. For example, even though ACCORDING TO THE RULES OF EVIDENCE evolutionism has been FALSIFIED innumerable times, yet, to the evolutionist, evolutionism simply can NOT be falsified because -- to the evolutionist -- evolutionism is simply true. I know that many of the posters here fall into the same category as the evolutionist in that there is nothing, in their view, that could falsify their position, or if there is, they place the benchmark so high that it is not valid. Further, I also realize that modern biblical scholars, by and large, don't have the first clue as to what even constitutes evidence, let alone how to interpret it, especially in the arena of textual criticism, as those of use who do understand the nature of evidence have roundly demonstrated, but there is nevertheless a hard and fast rule that every legitimate proposition has the capability of being logically and evidentially falsified. If it can't be falsified, it is not genuine, just like evolutionism and modern textual criticism. Now, if the cessationist position contains even an ounce of legitimacy, it possesses logical and evidential propositions which are capable of being falsified. Therefore, what are they? What would it take to falsify cessationism? Stating that you would have to see someone healed before your very eyes does not qualify as valid evidence, as far as it goes, according to the rules of evidence. I simply want to know -- what would it take to falsify cessationism? A belief you share with every cessationist. If there was a genuine case of some person speaking in tongues, would that falsify cessationism? For example, if an American who can only speak English went to Berlin and suddenly began to speak German to someone so as to testify of Jesus Christ, would that falsify cessationism? There are other examples for other gifts, but I'm just wondering if any one of these examples, such as the one above, would falsify cessationism? Let me help you with that: our cessationist friends would simply deny your genuine case, as they do with every other example that they are given. After all, they haven't seen miraculous gifts, so they must not be possible, right? And they can always twist some verses and come up with extra-Biblical logic to prove their point. "Let me help you with that: our cessationist friends would simply deny your genuine case, as they do with every other example that they are given." Well, it may seem like I'm picking on the cessationists, but that's not the case. I'm merely trying to get the cessationist to define himself. I don't have to do this with the non-cessationist because I already know what the vanilla non-cessationist claims. I really wonder if either side can logically define themselves. I have seen a lot of isegesis on both sides, but I am not interested in entering the debate. I have my own view on the matter, taught me by the Holy Spirit and the Word of God, and thus I am not looking for instruction on the issue. Rather, I am simply trying to come up with VALID lines of demarcation that would allow each side to be falsified. In that vein, I have yet to discern such lines from the cessationist camp. Perhaps they have been stated before and I just don't know about it. If so, where can I find them? Or is there any standard among cessationists? I already know what the standard is among the vanilla non-cessationists. I don't know what that standard is, if there is one, among the cessationists. Lamblion, you ask a great and relevant question. As I understand cessationism, it is an issue raised in the context of spiritual giftedness, that is, how ought a Christian “operate” in the power of the Holy Spirit today? Cessationists believe in spiritual gifts, just not the “miracle/sign gifts” of the Apostolic era. (The Warfield view, I believe). Turning to your hypothetical, and assuming the evidence issue could be overcome (i.e., we’ll assume it’s not a false or mistaken report for now), a few issues would, I think, remain. 1. The source of the tongue. The counterfeit issue. This is a longstanding debate, of course, beyond the scope of this thread. 2. Relevant to #1 would be to consider whether this hypothetical instance comports with the way tongues (as known languages) showed up in Acts. Each time it happened it was to a group, not an individual. 3. Whether this is a “gift” at all. IOW, would this be something the hypothetical tongue speaker should now “operate” in? A cessationist would say no. The Holy Spirit, of course, is allowed to do what he will in any situation, as in providing a healing of a person without bestowing THE gift of healing on an individual. IOW, it is not the same as validating the gift for operational use. 4. Whether this example of a language connection validates the use of a “private prayer language” as exercised by modern Charismatics. It would seem not. Those are some of the responses I’d have to your excellent challenge. 1) I am actually engaged in battle with my sword, whereas you aren't. 2) You are using "scared" as an excuse because you are afraid to admit that my sword is far more manly than yours. But why not use our swords to our advantage and fight off those that disagree!! I've read the article and done my best to follow the multiplicity of arguments going on here, allow me to enter on a fresh note. There are two ways in which I disagree with the argument that this book sets forth. First, I echo taliesin's point that just because something is revelation from God does not automatically make it canon. Biblical canon is God's revelation for all people at all times. It is entirely possible to receive revelation that is from God that is not for all people at all times, but rather for you at a specific time or for a body of believers, etc. To say that there is no need for mulitiple revelatory sources seems silly - I myself am trying to decide what manner in which to go to a closed country in the mission field. Can Biblical revelation tell me this? Can simple reasoning tell me this? No, the only way for me to receive unfailing guidance in this circumstance is to receive revelation from God. Second, I am not aware of any Biblical text that explicitly states that the office of apostleship has ceased. First, obviously there is more to apostleship than simply writing scripture, many apostles didn't write scripture. Second, I imagine your argument for why apostleship has ceased goes something like, "Christ is the cornerstone, apostles are the foundation" and clearly the foundation has been set so apostles are finished. I would disagree that the foundation has been set, and might even disagree that the foundation is not in need of fixing from time to time. For example, the foundation for the church in China had not been set, and I believe that if you look at the underground church movement in China you will see a small group of men who fit the scriptural requirements for the gift of the apostle. (1) They have seen Christ (in a vision, just at the apostle Paul did). (2) They live holy lives and imitate Christ to an incredible degree. (3) They perform signs and wonders. (4) They act as a foundation for the church. And (perhaps there is a 5th requirement by some interpretations) they have suffered greatly for the gospel. Whether or not there can be apostles in places where the church has been founded, I would be interested in discussing. And, of course, if apostleship is for today then your entire argument breaks down from the top of the waterfall. Let me know what you think. Sorry I don't have verse references for the requirements of the office of apostle, I will work on that. I hope this is permissable, but to lighten the mood a little, I have placed a WMV file on my website called "Bird For Christmas"
If you like clean southern humor, and especially if you're a good 'ol boy, this one will have you rolling on the floor. Go to my website and click on "Links" and you will see the file. My apologies if this is not appropriate. Waiting for Dan to answer my latest post in our long-running debate on this subject if he has time! First, I echo taliesin's point that just because something is revelation from God does not automatically make it canon. Good, then you hold a point no one argues, and that is irrelevant to this issue. Can Biblical revelation tell me this? Can simple reasoning tell me this? No, the only way for me to receive unfailing guidance in this circumstance is to receive revelation from God. Ah, so you believe in prophets giving inerrant revelation, which therefore could be canonical in quality. You also deny the sufficiency of Scripture. Those are problematic positions, oft-refuted here and elsewhere. ...I am not aware of any Biblical text that explicitly states that the office of apostleship has ceased. Do you know one that explicitly states the Trinity? Do you believe the doctrine nonetheless? Sorry, you're probably a very nice guy, but it is getting tiresome answering the same sidetracks again and again. Otherwise, read the book before you reject his argument rather than "imaging" it, as you say. Really? Paul (and I) would disagree with you. The church has one foundation, and it has been laid by the apostles and prophets (1 Corinthians 3:11; Ephesians 2:20). Otherwise, you're again rejecting the argument of a book you've clearly not yet read. It is hard to part with a tradition, though; I sympathize. For those who believe in modern day apostles and revelation, tell me by what authority you dispute with the Latter Day Saints, who believe exactly the same thing. If you do dispute with them, of course. Sorry, I hope I didn't come across as angry in my previous post. I do wish I could lighten the mood with some humor, I just enjoy debating and must be very direct otherwise my mind loses focus quite easily. Secondly, sorry for apparently putting forth a straw man, allow me to put some teeth on my foolish statements. 1. The reason that my first point is relevant is because I am making the very point that you seem to ignore in your second point. That is: just because there is inerrant revelation does not mean it is of canonical quality. God could tell me (with inerrancy) "go preach the Gospel in Maine" and yet that is not canon because it is not for all people at all times. (Every Christian should not then go preach the Gospel in Maine.) Thus an instance of inerrant revelation that should not be considered Canon. 3. Even the Trinity, with no explicit references, has numerous proof texts and is implied numerous times in the Bible. Could you perhaps enlighten me with at least one verse or combination of verses (like a defender of the Trinity would do) that might give insight into my apparent utter-ignorance of this concept that is oh-so-clear in the Bible? Yes, you are correct, I have not read this book, so if you would rather disqualify me from the discussion altogether, I understand. I have, however, engaged in this debate before (in my own life most of all), so I hope you will not find me too simple-minded. In response to jsb's question about how I dispute with LDS, the answer is simply Gal 1:8,9. Anyone who is a true apostle or prophet will not speak anything contrary to scripture. Even an angel giving revelation contrary to the original apostles is to be "accursed". Of course, the LDS would contend NOTHING they give is "contrary" to Scripture! Don't you realize the Bible does NOT teach the Trinity? The proper understanding of the various biblical passages came to the prophet Joseph Smith. Have YOU seen the Son and Father together like he did? Obviously, your tepid revelations are not as authoritative as Joseph Smith's! And so it goes. Once you allow for "modern day Apostles" you allow for Scripture-type revelation. You will be battling "Apostles" all day long. You have no way to assert your revelations as being any more valid than the dudes in Salt Lake City. jsb, in your experience has denying the continuation of the apostolic office meant that Mormons cease to appeal to Joseph Smith? In my experience, it has not. Whether I believe that the Canon is closed, or not; whether I believe that Apostles in the sense of Peter, Paul, and John have ceased, or not; whether I believe that Jesus Christ was the unique Son of God, or not; (all of which I do believe) has not helped when debating Mormons or any other cults. They deny those truths just like they deny the interpretation of the Bible on the Trinity. Because I hold them doesn't make Mormons any more or less receptive. Also, if (remember, open but cautious) the Bible teaches something and the Mormons happen to believe the same, I'm not going to cease believing it just because it's a point of agreement with the Mormons. Taliesin, you're right about it not making any difference to a committed Mormon. I went to law school with a Mormon bishop and we had a three year friendly, running debate. I hammered him with evidence. Nothing doing. Near the end he said, "You know, it all comes down to one thing: whether you believe in modern day revelation or not." If you do, his point was, then why deny what God is revealing to the Mormon church? In all my years talking with Mormons, I can only recall making a score once. Once. Two missionaries, both women, came to my door. One was the leader, of course, the other a young second chair. Fresh faced girl. Sarah, I think her name was. Well, we got into a chat and I presented my evidence. Nothing doing. Finally the lead says, "Why don't you just read the Book of Mormon with an open mind? If you do, the Holy Spirit will testify to you that it is from God." "But I did read the book of Mormon with an open mind," I replied (and I had). "And I got the strongest testimony that it is a lie from hell." (and I had). I said this matter-of-factly, because it was a matter of fact. Well, Sister Sarah's jaw almost hit the floor. Obviously she had never heard such a thing. The lead very quickly got her out of my house. The next week the lead was back, only THIS time SHE was second. She'd brought the heavy artillery with her, a woman who looked like she brushed her teeth with Brillo. That was a conversation I won't soon forget. Anyway, it's all to say, if you open the door to modern day revelation, I can't see on what basis you can deny the Mormons. Because their revelation doesn't align with the Scriptures. New revelation, even during the age of the Apostles, had to be consistent with the revelation previously given. If Paul actually contradicted Moses, we'd have to drop Paul. Mormon teaching clearly contradicts the Scriptures. On that basis I deny the Mormons. I do not deny the Mormons because they believe in continuing revelation. on further consideration... -- here are some posts in which I've dealt in essence with everything you're saying. And yes, you are downgrading the sufficiency of Scripture, by an un-Biblical notion of the Christian life. It goes back to the Garden: "See? The one thing you really need, God didn't give you!" But the Mormons answer all this. They do not speak contrary to the Bible. The Bible you hold in your hands is a human translation (anyone disagree?) God has graciously revealed copyist's errors for us. Even better, he's given us for all time ANOTHER book! How do we know? The Father and Son appeared directly to Joseph Smith. Have you ever had that happen? Then why are you denying the message? A message that has been confirmed, over and over, by countless revelations to modern day prophets? Eventually, you see, you can't win this fight on their turf. It's like tic-tac-toe. The best you can do is tie. If you concede modern day, apostolic revelation, they have it in spades. "But the Mormons answer all this. They do not speak contrary to the Bible." The problem is that they do speak contrary to the Bible, specifically and obviously. Again and again the main arguments against continuationism come from guilt by association. It would be like someone saying that they disagreed with reformed theology because Luther was a big time racist. The only way to logically take that position would be to show that reformed theology SHOULD lead toward racism. Otherwise you are commintting fallacies galore. If you can demonstrate that continuationism in the biblical gifts of the spirit should lead to mormonism than you win. Unfortunately you would then have to argue that the Holy Spirit would undermine scripture, something you should be unwilling to do. let me guess the response..."see, you're doing what the mormons do, saying that the Holy Spirit would never undermine scripure so the vision must have been legitimate!" that is why everything should be judged to see that it is in accordance to scripture, not making scripture somehow squeeze into accordance with a vision. See, Joey, amigo, this is like Indication #12 that you're not paying attention to this discussion. I have probably posted most frequently on this subject on this blog. Name ONE TIME that GBA has been a major argument of mine against leaky-canon errorists. ahh, but I didn't say "dan uses gba time and again." Now who is not reading who? I was referring to the fact that time and again Benny Hinn, or mormons etc are used as an example as to why continuationism is wrong. This is a logical fallacy unless it is demonstrated that continuationsim necessarily leads to those things. The people who use gba might think it does, but they don't usually say why. Joey, GBA never entered my mind. I'm merely trying to look at theological processes and consequences. Cessationists believe the Bible is "progressive revelation" (the NT is in the OT concealed; the OT is in the NT revealed) and that the canon is closed. But Mormons believe there is still ongoing, progressive revelation of the NT variety. They will show you how they do NOT contradict the Bible, but make it clearer and add to it. And they have a pretty strong argument if you agree with them that Apostles still recieve these revelations today. The greatest of these is that Jesus himself appeared to Joseph Smith, just like he did to Paul. Why, then, do you accept Paul and not Smith? Perhaps you're resisting the Spirit. And we're back to the merry go round again. fair enough, the obvious difference between continuationists and mormons being the fact that continuationists affirm that the canon is closed, and cannot be added to. djp I am voraciously reading the articles you mentioned, as well as a few others I am finding in my searches of your writings, and am composing a reply. Given the number of arguments you put forth, however, it looks to be a lengthy response. I'd be better off emailing... give me some time though, this is one busy week. Thanks so much for the food for thought. First, Joey says, "Again and again the main arguments against continuationism come from guilt by association." Then Joey says, ahh, but I didn't say "dan uses gba time and again." Did you mean to post this on another blog, then, under a post authored by a different writer? Illustrating the principle: A silly position requires silly defenses. Of course, there is that other option. You could always abandon the silly position. yes, you started this discussion, but many others have added to it...I was unaware that it was automatically assumed I was addressing you. My apologies. As for abandoning my "silly position" I will...as soon as it is demonstrated from scripture that I should. I'm sure that you believe that you have done this...and I'm sure you think the reason I am unconvinced is that I haven't read you properly, if at all etc...on the contrary, I do read your stuff, and for the most part love it...this issue is an exception. "I am compelled to run over them"